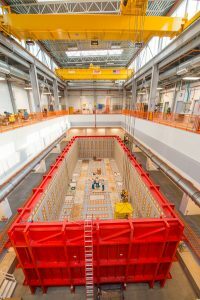 The ICARUS neutrino detector measures 65 feet long and weighs 760 tons. It began its life in Gran Sasso Laboratory in Italy, seeking out elusive particles using pioneering technology. It later spent two years undergoing upgrades at CERN, the European particle physics laboratory and home of the Large Hadron Collider. It moved to Fermilab in 2017 and was installed in its detector hall in 2018. The detector will start collecting data at the end of 2019. The ICARUS collaboration is investigating signs of physics that may point to a new kind of neutrino called the sterile neutrino. Other experiments have made measurements that suggest a departure from the standard three-neutrino model. ICARUS is also investigating the various probabilities of a neutrino interacting with different types of matter as well as neutrino-related astrophysics topics. In this context, the detector also serves as a next step in a phased program towards the construction of massive kiloton-scale detectors for future neutrino physics, such as the Fermilab flagship, the Deep Underground Neutrino Experiment. Nobel laureate Carlo Rubbia of the Italian Gran Sasso Science Institute and INFN leads the ICARUS collaboration, which consists of more than 85 scientists from 16 institutions.